We Filipinos really love basketball..
Guys, let's post news, updates, etc..here. Manny Pacquiao launched the Maharlika Pilipinas Basketball League on August 29, 2017. 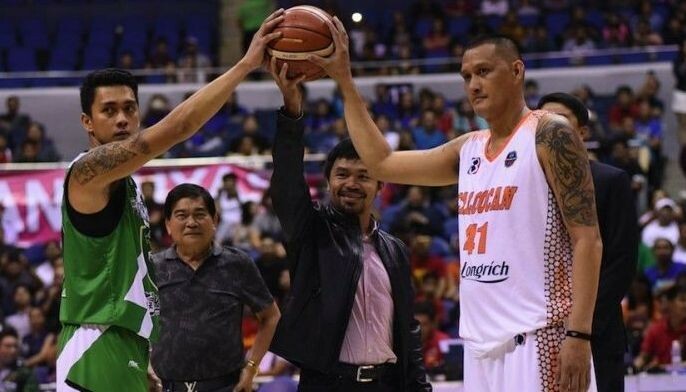 According to Pacquiao, the league is not intended to be a competitor to the Philippine Basketball Association, the country's top professional basketball league. The MPBL will feature both a regional commercial and barangay-level league with teams on the commercial side to have a home locality in addition to a corporate sponsor. 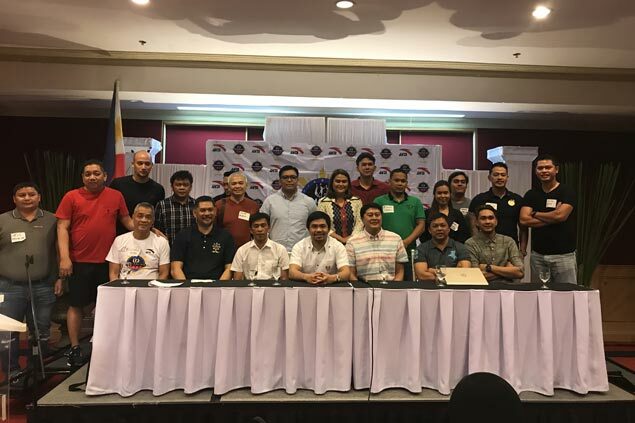 Initially, the league will be held mainly in Luzon with future plans to expand to accommodate teams based in Visayas and Mindanao has been now defunct Metropolitan Basketball Association. 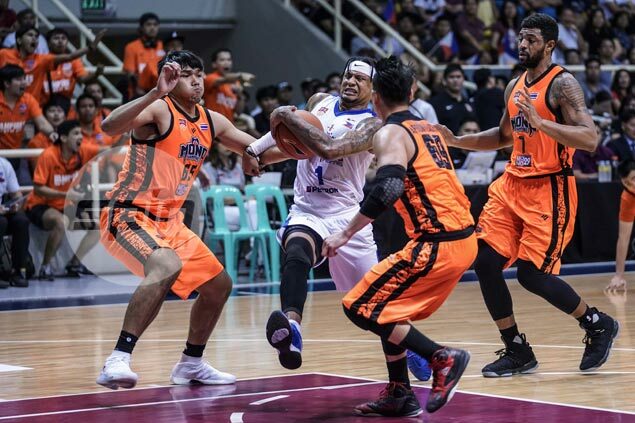 It is planned that an expanded MPBL will have two divisions, North and South, where the best teams from both divisions will face in the finals similar to the format of the National Basketball Association of the United States. The league was planned to start as early as September 23, 2017 with at least six teams. A pre-season was held with the Bulacan Kuyas finishing as champions. The inaugural cup of the MPBL, the Anta Rajah Cup commenced on January 25, 2018 and was participated in by ten teams. In the opening game at the Smart Araneta Coliseum, the Parañaque Patriots secured a 70-60 victory over the Caloocan Supremos. The first conference was ran until April 19, 2018 where the Batangas City Athletics crowned as the league's first-ever champion. After the Anta Rajah Cup, the MPBL will plan to conduct the staging of the second conference, which will be patterned after the National Basketball Association (NBA). The tournament will begin on June 12, 2018, coinciding with the Philippine Independence Day celebration, with additional expansion teams including from the Visayas and Mindanao region will set to join the year-long conference divided into Northern and Southern Divisions. The two winning teams from the divisions will face off in the National Championships and the winner will bring home a 10-million pesos worth trophy and ball rings to be given for the members of the champion squad. After its inagural cup, the 2018 Anta Rajah Cup, the MPBL had expanded its roster of teams to 20. All teams are expected to play in the next cup, except for Mandaluyong, who won't be participating yet due to lack of facilities. After the ten expansion teams were admitted into the league, it closed its doors for new applicants from Luzon. This was done to leave room for future Visayas and Mindanao teams. A meeting in Cebu was held on April 28 for potential Visayas and Mindanao teams. Davao Occidental became the first MPBL team from the Visayas-Mindanao region. MANILA, Philippines — The Maharlika Pilipinas Basketball League (MPBL) will launch its second tournament on Independence Day, June 12, and founder Sen. Manny Pacquiao is optimistic that more teams will join to expand from a Luzon conclave with 10 teams in the inaugural edition to a nationwide competition involving up to 24 squads split into the Northern and Southern divisions. The MPBL is now in the last stage of the playoffs with the Batangas Tanduay Athletics safely in the best-of-5 Finals. Game 2 of the best-of-3 semifinal series between Parañaque and Muntinlupa was played last night. Batangas topped the single-round eliminations with an 8-1 record and disposed of Bataan, 2-0, in the best-of-3 quarterfinals before taking out Valenzuela, 2-0, in the semifinals. It was recently announced that the champion will receive a cash prize of P1 Million. The plan for the second tournament is to play a single-round elimination then there will be a series of playoffs within each division before the Northern and Southern winners dispute the championship in the Finals. It’s a format that’s similar to the NBA where instead of Northern and Southern divisions, it’s the Eastern and Western conferences. How many teams will advance to the playoffs is dependent on how many teams will participate. If there are 24 teams, eight could enter the playoffs in each division. Metro Manila (CNN Philippines) — Senator Manny Pacquiao revealed Tuesday his latest foray into basketball with the launch of the Maharlika Pilipinas Basketball League (MPBL). The new league will be all-Filipino, geographically based and will have a home-and-away format at the national and the barangay levels, Pacquiao said in a press briefing. Senator Pacquiao, who is listed as the head coach of the Philippine Basketball Association Kia franchise, says the MPBL does not seek to compete with other leagues in the country. Sports journalist Snow Badua will serve as the league commissioner, while former professional cager Zaldy Realubit will be the operations head. For its first season which tips off September 23, there are 12 Luzon-based teams including Makati City and Quezon City that are committed to the national league. There are plans to expand to the Visayas and Mindanao in the coming years. The teams competing in the national level will be divided into two conferences, with the teams required to have at least 20 percent of their roster from their home city, league officials said. The roster can be recruited from the barangay level of the tournament, they added. Foreign players are prohibited from the league, they added. Foreign-born Filipinos will be allowed to participate once they show proof of Filipino parentage from the immigration and justice departments, Badua said. There will be five conferences per season, with the team claiming the most titles winning the overall championship at the end of the year. Badua said the MPBL is in talks with a television network to air the national league games, while games at the barangay level will be streamed online. MANILA, Philippines - Sen. Manny Pacquiao said the other day he has no intention for the Maharlika Pilipinas Basketball League (MPBL), his latest sports venture, to compete with the PBA where the boxing icon is listed as playing head coach of the Kia/Mahindra franchise. Pacquiao explained that the MPBL will introduce a novel format with a distinct barangay and commercial flavor. The league is set to be inaugurated on Sept. 23 with 12 franchises. The concept is to play barangay and commercial games on the same day. Pacquiao said under negotiation is a TV contract where selected games will be shown live on Tuesdays, Thursdays and Saturdays. The commercial side will feature host cities or towns for each team with a corporate sponsor. The barangay component will take a “farm” concept where players showcase their skills for scouts to determine if they’re ready for elevation to the commercial league. It appears that mechanics are still being ironed out as to whether barangay players may be available for immediate call-ups or they will be gathered for a draft to start a new season. Whatever is the final process, Pacquiao said the idea is to give barangay players the chance to be discovered and perform on the big stage. The league format will be home-and-away. Quezon City, Marikina, San Juan, Makati, Paranaque, Bulacan, Pampanga, Laguna, Batangas, Manila and Malabon are among the possible hosts for teams in the first season. Pacquiao said the opening franchise fee is P500,000 and some companies are lining up to pay even without a team to guarantee a place in the league. “The plan is to raise the franchise fee to at least P2 Million after the first conference or season,” he said. “So companies are looking to invest now at the initial offering fee.” Pacquiao identified two companies that had teams in the PBA D-League as among the initial investors. Pacquiao said there is no age limit for players at the barangay or commercial level. But the MPBL will not recruit imports. “Fil-foreigners are welcome for as long as they’re dual citizens with Philippine passports,” he said. “We’ll also welcome ex-PBA players who want to continue playing.” Pacquiao singled out Zaldy Realubit and Allan Caidic as two former PBA players who are helping out the MPBL in the front office. “At the start, the MPBL will play only in Luzon but as we move forward, my plan is to divide the league into the North and South divisions,” he said. “We’ll play a regular season then split the playoffs for teams in the North and teams in the South like in the NBA. The best team in the North will play the best team in the South in the Finals.” It’s likely that the MPBL will play one tournament or season per year. Pacquiao said at the end of five seasons, the MPBL will offer a grand cash prize for the champion teams. The more championships a team wins, the more cash it will earn in every five-season cycle. “I don’t intend to compete with the PBA,” said Pacquiao. “The MPBL will bring in a different set of players.” It’s possible that players who shine in the MPBL will eventually get the opportunity to be drafted by the PBA so the leagues could be complementary. Regarding officiating, Pacquiao said the MPBL will come up with a selection process where referees are chosen to work specific games by lottery on the playing day itself. Referees will not know their assignments until the lottery. Pacquiao said the MPBL will make sure officiating is fair to all teams and transparent. 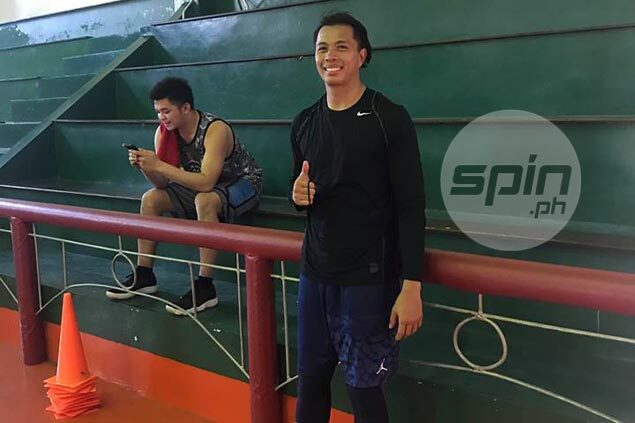 FOLLOWING his stint in the Asean Basketball League (ABL), Ray Parks Jr. will be suiting up for Mandaluyong in the Maharlika Pilipinas Basketball League (MPBL), head coach Mac Cuan confirmed to SPIN.ph on Thursday. The two-time ABL MVP will be joined by fellow San Miguel Alab Pilipinas players Lawrence Domingo, JR Alabanza, and Oping Sumalinog in the El Tigre roster, Cuan added. Despite his impending stint in the MPBL, Cuan, who is also the assistant coach of Alab Pilipinas, believes Parks is very ripe to join the PBA draft this year after his impressive stint in the ABL. “I will never tell him not to join the draft. Hinog na hinog na siya,” said Cuan. Parks is coming off an impressive showing in the ABL, where he led Alab Pilipinas to its first-ever ABL crown by beating Mono Vampire Basketball Club in five games. He also won the Finals MVP award. But with the 2018 PBA draft set in December, Parks can keep busy by playing for Mandaluyong in the MPBL. Parks’ stint in the MPBL should also be a big boost for the fledging league, which has drawn 25 teams for the coming conference from 10 in the inaugural conference — the Anta-Rajah Cup. Mandaluyong also gets a quality big in Domingo, who averaged 9.8 points and 6.9 rebounds for Alab in the recently-concluded season. Alabanza and Sumalinog were also key reserves in Alab’s title run this year. CEBU CITY – Local hoops hero and former pro Jercules 'Jojo' Tangkay finally made an appearance in Day Three of the five-day tryouts for spots on the Casino Active-Cebu Ninos team competing in the second season of the Maharlike Pilipinas Basketball League (MPBL). Still looking incredibly lean and fit for a 41 year old, the lefty wingman drafted in 2001 by Sta. Lucia, did not even participate in the on-court activities and watched from the sidelines with another local standout who is also being eyed by the Ninos, Ferdinand Lusdoc. Tangkay shared that as much as he would like to play for his home team, he already has a standing offer from the Zamboanga Valientes. However, he is more than willing to hear the pitch of Casino Active officials and later, decide on what team he would play for. Tangkay said he will be joining the others on the court on Thursday. “Actually, before pa lang nag-start ang first season ng MPBL, the officials there in Zamboanga already offered me and several other players the chance to play for their team. That plan didn’t go through but once they finally settled on having a team, they once again contacted me,” said Tangkay, a two-time MVP of the defunct Philippine Basketball League. Also getting offers from Zamboanga were former pro Reed Juntilla, the Daa brothers Dennis and Dino, and former Letran Knight Hafer Mondragon among others. Ninos head coach, Gilbert Castillo, was thrilled at the sight of Tangkay. “I’m glad to see him here, to see that he is interested in joining the team. Hopefully, our talks with him are fruitful and we’ll be able to have him on this team,” said Castillo. According to Casino Active spokesperson Jerome Calatrava, Castillo will meet with team manager Mark Castillo and the other officials to set the best course of action regarding Tangkay. 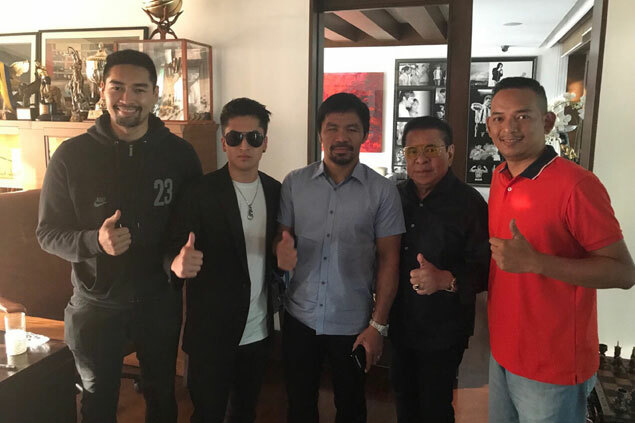 Chavit and Christian Singson meeting with close friend and MPBL owner Manny Pacquiao. FOR a long time, the Singson family of Ilocos Sur, led by patriach and former governor Chavit Singson, has been tagged as king makers in politics. Now the family hopes to do the same in basketball. The well-known family from the North has waded into new territory as young Christian Luis Singson has put up a basketball team of his own, the Mandaluyong Tigers, in the Maharlika Pilipinas Basketball League (MPBL). The Singsons' participation in the MPBL, which is owned my boxing icon Manny Pacquiao, did not come as surprise as the eight-division world champion is close to the governor. And now that Singson’s 22-year old son is part of the MPBL, Pacquiao believes that the young cub will bring his father’s winning tradition. “We hope so. Kilala naman natin ang mga Singson. May winning tradition,” said the MPBL owner. And it seems the Mandaluyong team is on the right path. The young Singson vowed that he will form a competitive roster in a bid to help Mandaluyong immediately create an impact in the fledgling league. Singson, himself a former playmaker of the British School Manila at the Bonifacio Global City, said he is looking to beef up his roster with five players from ABL side Alab Pilipinas, which is owned by Mandaluyong Tigers’ patron Charlie Dy. “We will make this team exciting and we’re going to pull off surprises sa pagbuo pa lang ng lineup namin. We don’t want to be a pushover kahit bagong team kami,” said Singson, now the youngest team owner in Philippine basketball. “Pressure din kasi ito dahil ayaw kong mapulaan ako ng daddy. Alam niyo naman si governor, he is a born winner. And I want to follow in his footsteps rin in being successful sa mga endeavors,” he said. Singson said tryouts for the team will be held in the coming days to give the locals of Mandaluyong the chance to achieve their basketball dreams. “Syempre po, malaking bagay para sa amin ang mga young players na gusto ring sumikat. Di lang naman natin isesentro sa mga sikat na at kilala na ang pagbuo ng team,” said the soft-spoken Singson. “Kaya maghanada-handa na po sila lalo na 'yung mga taga-Mandaluyong. Kasali po sila sa team na ito,” he added. Representatives of teams from the South in a meeting with MPBL officials led by league owner Manny Pacquiao and Commissioner Kenneth Duremdes. CEBU CITY - Despite Cebu's reputation as the hoops hotbed in the south, only one team from this province in Casino Active beat the deadline and committed to joining the Maharlika Pilipinas Basketball League (MPBL) in its second season. A number of companies were said to be interested in joining the league founded by boxing superstar Manny Pacquiao, including long-time Cebu basketball pillars Cebu Landmasters and M. Lhuillier. However in the end, it was only Casino Active, a brand owned by International Pharmaceuticals Inc., that managed to confirm its participation, becoming the fourth expansion team from the south after the Davao Occidental Tigers, the Zamboanga Valientes and the General Santos Warriors. In a meeting with Pacquiao and MPBL commissioner Kenneth Duremdes last week, Cebu teams have expressed dismay over the lack of home games for South clubs under the league format. Casino Active spokesperson Jerome Calatrava bared the team will be staging tryouts starting this Monday, 12 noon to 2 p.m., at the Capitol Parish Gym along Escario Street. The tryouts will last until Friday. “We’re already in talks with several ex-pros but nothing is definite yet. That is why we’re holding the tryouts and see what our coaches can come up with,” said Calatrava. The team is being coached by former Letran standout and PBA player Gilbert Castillo while the team manager is Mark Castillo. The team is initially being called the Ninos but that remains a tentative moniker as it was last used by M. Lhuillier Kwarta Padala in the defunct Liga Pilipas tournament. Casino Active officials will also be meeting with Cebu City officials to talk about a possible collaboration as well as the use of Ninos as a moniker. Calatrava said the team has already set lofty goals for its maiden season in the MPBL. “We’ve set our eyes on making it to the semifinals. That’s it. That’s the first goal of this team,” Calatrava said. CEBU CITY — The lack of home games is proving to be a prickly issue for representatives and owners of teams that are looking to join the south division of the second season of the Maharlika Pilipinas Basketball League (MPBL). In a consultation meeting with league founder Senator Manny Pacquiao, Chief Operating Officer Zaldy Realubit and Commissioner Kenneth Duremdes, the prospective teams were told that initial plans for the second season, which is set to open on June 12, would have them staging just one home game, with all the rest to be played on the road in various parts of Luzon. “Majority of your games will be in Manila. One game will be played on your own homefloor. The concern of ABS-CBN is mahihirapan sila sa schedule nila. Yung ABS- CBN, may ibang commitments na rin kasi,” disclosed Realubit. Pacquiao, however, tried to ease the concerns, saying the format will only be for the elimination round. The home-and-away format would be in play during the playoffs, he assured. “Eliminations lang yun. Iba yung sa playoffs. Kung makapasok kayo sa playoffs, maraming homecourt na pwede mangyari dun,” said the boxing superstar. That proved to be the start of a lengthy discussion regarding the matter, with teams arguing that the lack of home games for South-based teams defeats the purpose of having a nationwide league. “For example, Davao City kami, we’ll only have one game there and all the rest will be in Manila? Does that mean that the fan base namin sa Davao won’t get to see us play?” said the representative of the team from Davao City. Another from Davao Occidental expressed that this format would alienate their fanbase, not to mention ramp up operational expenses. Mike Reyes, the brother of Gilas head coach Chot Reyes who was there representing the Cebu Landmasters, said that hearing of that plan was disappointing especially since basketball teams from this part of the country had long been pining for high-level basketball. “We’ve all been waiting for this kind of league pero kung babalik rin pala tayo lahat sa Manila, so we’re all reconsidering this,” shared Reyes, the current athletic director of Southwestern University-Phinma. As it is, competing in the fledlging will not be cheap. Pacquiao told those in attendance the franchise fee has been set at P10 million. To make it easier for team owners, the senator said that they can pay a downpayment of P4 million and pay P500,000 each month for succeeding months. There’s also a conference fee of P200,000 as well as a cash bond of P200,000, he added. Nevetheless, Duremdes said the discourse was exactly what they were here in Cebu for. “We’re here for the consultation. We’ll see if that’s the majority. We understand yung gastos talaga going to Manila is a concern. Pero kaya nga andito kami para mapag-usapan natin what’s best for you guys and what’s best for the league,” the former PBA MVP said. The north division of the MPBL has already signed up 10 new teams, bringing the total number of squads to 20. The next step of the league to truly make it a nationwide one is to expand to the south. Team representatives from Davao, Cebu, Bukidnon, Cagayan de Oro, Masbate and Zamboanga, which confirmed its participation on Saturday afternoon, were at the meeting. “We are hoping for the south divisions teams to commit to playing in the MPBL. The first conference was a success and that’s why we’re expanding here to the south. We’re hoping more teams can participate. “The vision of the senator is for the players from the grassroots level, the ex-pros that weren’t given a chance, and basically all Filipino players,” said Duremdes. INAUGURAL Maharlika Pilipinas Basketball League (MPBL) champion Batangas has expressed interest in signing former PBA MVP JayJay Helterbrand as it bids for back-to-back titles in the fledgling regional league. 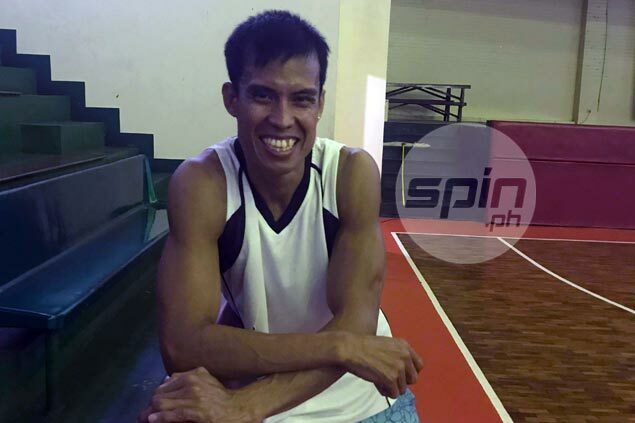 Team manager Dondon Dimacuha disclosed the franchise is eyeing the retired 41-year-old guard, who it believes is a perfect fit for the Athletics especially after previously suiting up for the Batangas Blades in the defunct Metropolitan Basketball Association (MBA) before taking his act to the PBA. 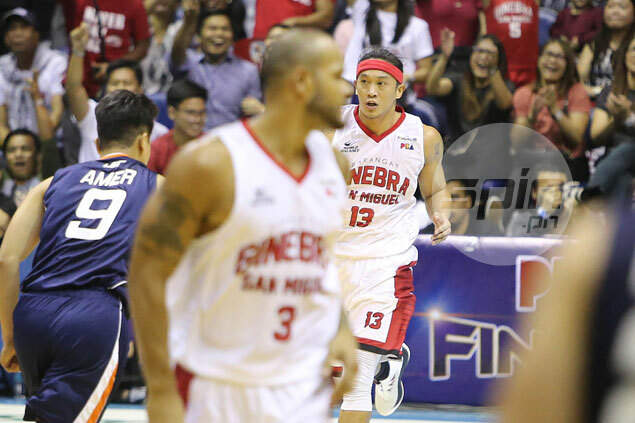 Helterbrand, who was MVP in the PBA in 2009, retired following the PBA’s 42nd season after spending his entire PBA career playing for Barangay Ginebra. The former Ginebra guard is still fit and active in the legends circuit. He recently suited up for the Malolos Agilas in the Republica Cup in the Bulacan capital. Batangas-Tanduay Athletics owner Bong Tan later confirmed the team is taking into consideration the recruitment of Helterbrand. Dimacuha admitted the Athletics still have remaining budget to accommodate a player of Helterbrand’s caliber. “Ang suggestion ko, dahil meron pa silang budget ay kumuha tayo ulit ng ex-PBA player,”said Dimacuha, former mayor of Batangas City. Other than the available funds, the Athletics can accommodate Helterbrand since two players from their champion team in Mark Olayon and Bong Quinto, respectively, won’t be available for the coming second conference since they are bound to return to their respective college schools.